Begin again with a little help from Joel Osteen who wants you to know God's plan for the best possible life for you. Feel like you're ran out of second chances? God loves to give people fresh starts. He wants everyone to see His blessings in new ways so we can reach our full potential and achieve extraordinary levels of success. In this truly one-of-a-kind guide, Joel Osteen encourages growing Christians with a "How to Study the Bible" and "Bible Promises" feature to help everyone find the courage to start over and live their best lives now. In Fresh Start, readers learn what it takes to rise to a new level of honour, a new level of influence, and a new level of favour. 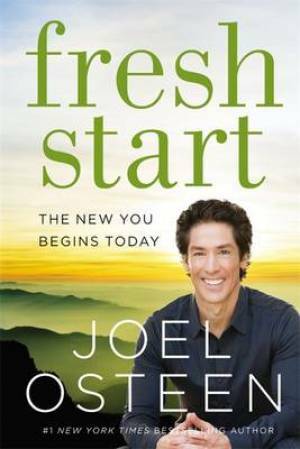 Fresh Start by Joel Osteen was published by Hodder & Stoughton General Division in March 2016 and is our 8386th best seller. The ISBN for Fresh Start is 9781473637382. Be the first to review Fresh Start! Got a question? No problem! Just click here to ask us about Fresh Start.